Luxury accommodation and 5 star resorts in the Byron Bay, Tweed valley and Tweed coast, Gold Coast hinterland, Tamborine Mountain region of New South Wales and south east Queensland, Australia. 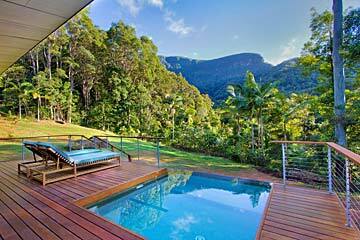 Exclusive five star rainforest and mountain accomodation more than $350 plus per night. Luxury accommodation more than $350 per night in the Byron Bay, Tweed Valley, Gold Coast hinterland and Tamborine Mountain regions of NSW and QLD, Australia. Deluxe and Luxury Accommodation from $250 and $350 plus per night. The Northern Rivers NSW and South East Queensland region of Australia, including Byron Bay and hinterland, Tweed Valley, Tweed Coast and Kingscliff, the Gold Coast hinterland and Tamborine Mountain, offers a range of deluxe and luxury 4 to 5 star quality accommodation. Usually located in striking natural settings or rainforest "far from the madding crowd", these luxury five star retreats, boutique and small scale lodgings, generally cater to fewer than 15 couples, assuring guests of seclusion and privacy. If you prefer the coast, there is an increasing array of coastal resorts and hotels offering a choice of full service suites or limited service and self catering apartments, with on-site resort facilities like licensed restaurants, day spas and fitness centres. Set on 100 hectares (250 acres) at the end of a peaceful valley, this couples only national and international award winning rainforest retreat is bordered on three sides by World Heritage National Park, assuring true peace and privacy. Offering the perfect romantic getaway with privacy, comfort and luxury in a stunning natural location, Crystal Creek Rainforest Retreat comprises 13 private architect-designed luxury bungalows, all self contained, with double spa baths and rainforest views, in a spectacularly pristine Australian rainforest. Fully prepared gourmet meal hampers are discreetly delivered direct to your bungalow. From AUD $375 p.n. to $655 p.n. midweek, 2 night min. Book selected deluxe accommodation from $250 - $350 pn below via Booking.com*. Click the business names to go to Booking.com listing. Located on absolute beachfront with stunning views of the Pacific Ocean. All apartments feature spacious open-plan living areas, en suite bathrooms, polished timber floors, kitchen, laundry, and a balcony with BBQ facilities and an outdoor setting. Facilities include terraced pool area with hot and cold pools, a spa pool and private sun decks, in landscaped gardens. A fully equipped fitness centre and licensed restaurant open for lunch and dinner are also on-site, with local restaurants and cafes a short stroll away. Luxurious beachside resort with tennis courts, a tropical swimming pool and a large lagoon pool. All air-conditioned rooms include a private balcony, a flat-screen TV with satellite channels, an iPod dock or CD player, a minibar, a refrigerator and ironing facilities. All suites also include a fully equipped kitchen and laundry. Broadband or WiFi access is also available. The Spa At Salt features a steam room, spa bath and a range of massage, facial and body treatments for men and women. A licensed restaurant serves breakfast, dinner and cocktails. Spa facilities include a hot tub, indoor pool, massage, tennis court and peaceful, private gardens to relax in. The tariff includes breakfast, and guests can book spa treatments and services. Shared lounge, free WiFi and free private parking is available on site. The award-winning Escarpment Retreat & Day Spa is set amongst 1.6 hectares (4 acres) of botanical gardens, offering private villas, a house, a day spa and spectacular mountain views. The 6 luxury villas feature cedar wood floors, a wood fireplace, sunken lounge room, private balcony, four-poster bed and spa bath. Free champagne and chocolates are provided on arrival. Guests can also enjoy a range of massage options in the luxurious Spa Pavilion or relax in the private Gold Class cinema. Free WiFi is available in communal guest areas. Where the incredible sunsets turn Mt Warning and the mountains into veils of purple and gold, creating one of the world's most inspirational views. Self catering available in the fully equipped state-of-the-art gourmet kitchen. Weekend, midweek and pampering packages available. From AUD $375 p.n. Book selected luxury accommodation from $350 plus pn below via Booking.com*. Facilities include a 25-metre infinity pool, fitness centre, sauna, a spa and wellness centre and daily yoga sessions. The resort provides a free shuttle into Byron Bay, and the licensed restaurant showcases a seasonal menu of Northern River's local produce. Nestled on 23.8 hectares (50 acres) of absolute beachfront, private beach villas boasts modern beach architecture and interiors inspired by the natural beauty of Byron Bay. Facilities include an exclusive beach club, lagoon pool, rainforest eco trail, outdoor fitness circuit and tennis court. There's also a 5 room day spa, shared lounge areas and cosy fire pit. The property also offers a business centre, conference and function facilities, a library, currency exchange services, in-house movies, and 2 food and beverage options. Guests can enjoy a swim in the outdoor infinity pool, or relax in the hot tub. A complimentary guided bird walk is offered daily, and there's also a library with a fireplace and a games room with billiards and table tennis. Each apartment has antique furnishings and a lounge area offering a cinema-screen with a hidden projector and BlueRay DVD player. All apartments have a four-poster bed and a deluxe bathroom with a spa bath and golden fittings, as well a fully equipped kitchen and laundry facilities. The property also has a day spa and sauna, barbecue area for outdoor meals and lovely courtyard gardens.